The Writing Bug: How do you find time to write? Do you remember watching Seinfeld? Classic show. How about the episode about the Summer of George? I'm asking because I feel like this summer has been the Summer of Brooke--where I'm in a fog of unmotivated laziness and the juice of it drips down my chin. I feel like George. Now of course I'm not actually lazy. I'm raising four daughters and there is no time for actual laziness. (Laziness is a luxury I can't afford.) But I'm exhausted at night, my only time to write, and I crash out on my pillow instead of emptying my head of story ideas and scenes. I want to write. I need to write. It fills a part of me that no kid kisses or husband dates can, but lately I haven't been able to shake the summer and stay awake to feed my passion. I used to find time to write by staying up till the wee crack of dawn. But it hasn't worked this summer. For some reason I need sleep so my writing time has become precious and sporadic. This isn't good enough. I need ideas. I find time to write by . . . I know everyone is balancing some part of their life or sacrificing it to write. So how? Do you create a routine? Or do you fill in the cracks of your life with words on a page? How do you stay awake and shake the summer? Brooke, for me sleep almost always tops writing, because I can't write if my brain is too foggy to think. But my best way to find time is to get up before everyone else (and then not go online). Sometimes I write at night, but mostly, I just find a few hours in a day where I tell everyone to leave me alone and lock myself in my room to type. If I have to be social, I've learned to write with a TV on and still maintain a conversation. But lately, I've been lazy as well. The heat wave did me in. By deciding that the cleaning can wait, whatever my husband cooks for dinner works, and laundry can be postponed. Then get off the internet. I find time to write by being aware of the moment at hand. Often it will open a window of time to write, and so I do. If it doesn't, I stay tuned in to what is happening and choose from there. That leads me not only to where I need to go, but circles around back to some writing time that I had not planned. I work to enjoy those moments I am unable to write, instead of fretting about not writing. It's in those moments new ideas, storylines, etc. decide to come knocking. And, of course, I am grateful for the time I am allowed to put fingers to keyboard. Interesting, Brooke. I've been sleepy this summer as well, and I'm often tempted to stretch out on the couch in the afternoon instead of working at my computer. The need for sleep trumps everything else in my opinion because we can't stay healthy and happy without it. However, fashion a sign for your work space that says, "Quiet, writer at work," and insist your family respect the sign. Take a writing break whenever you can, even if it's only 30 minutes. Don't make excuses (I can't focus that fast or I need at least a two-hour stretch, etc.). Just do it. The rest of the time, relax. Write stuff in your head. Jot down a note from time to time. Writing in your head or making notes can be a productive part of the writing process. I think I have to make time to write, rather than find or take time to write. Of course, that is not to say I've been doing that. Glad to know I'm not the only one. It's so nice to know I'm not alone. Isn't it funny how things we hate doing on a normal day seems necessary when we sit down to write. Why is that? I've discovered that writing on Sunday mornings is the best time for me. I spend Saturday doing the errands, laundry and housework so it leaves Sunday's wide open. It doesn't mean I haven't succumb to internet surfing or bill paying but I do make a point to write whether it's for 30 minutes or 4 hours. Can someone tell me how soon to send out queries? Should my book be complete first? Dolores, have a finished polished script done before you query. Some agents can request that day and then you'll be in a world of hurt. 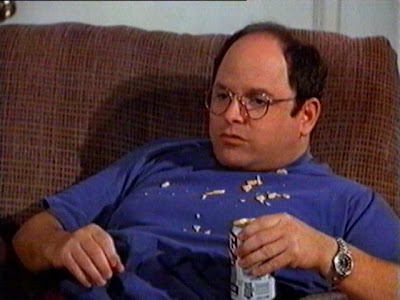 As a man with no wife, and no kids I can only say that in my opinion the best way to not find yourself stuck in your own summer of George (fantastic episode by the way) is by leaving your home to write. Maybe a coffeeshop. Or simply going to your backyard, if you have one. Play on repeat some some repetitive, but pleasant, song you've heard a million times and don't go back to your bedroom till an hour has passed. There are plenty of coffeeshops where I live (Seoul, South Korea), so I've just been writing, people watching and resisting the urge to go online. Right now I'm just keeping my head above water with family drama taking precedence over my writing. My motto for now is One Day at a Time. I will get back to writing when the time is write.